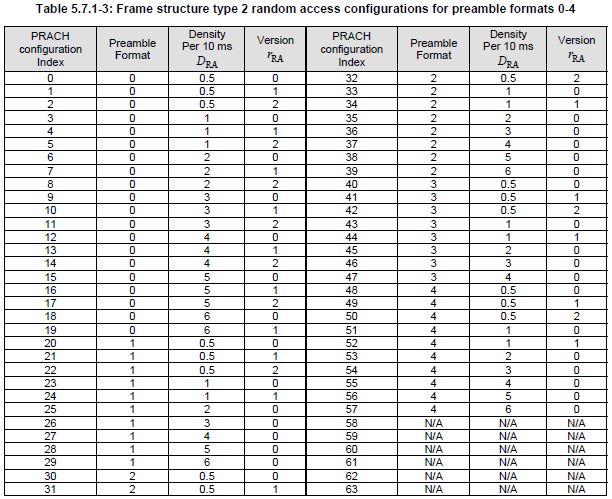 For the examples of TDD resource grids for each Subframe DL/UL Configuration and Special Subframe Configuration, see Frame Structure Frame Type 2 Overview section. Refer to 36.211 5.7 Physical random access channel for the details. Refer to 36.213 7.1.7 Modulation order and transport block size determination for the details. In case of FDD, it is pretty simple and obvious for UE to transmit HARQ ACK or NACK. UE start preparing the response as soon as it completes the decoding PDSCH and transmit it 4 ms (4 TTI) later. But in TDD, UE cannot transmit the response in such a fixed timing as in FDD. It has to wait until it gets the next chance for UL transmission and the next chance will be different depending on UL/DL configuration. Even when UE gets the chance to transmit the UL, it is may not always possible to transmit all the necessary response. 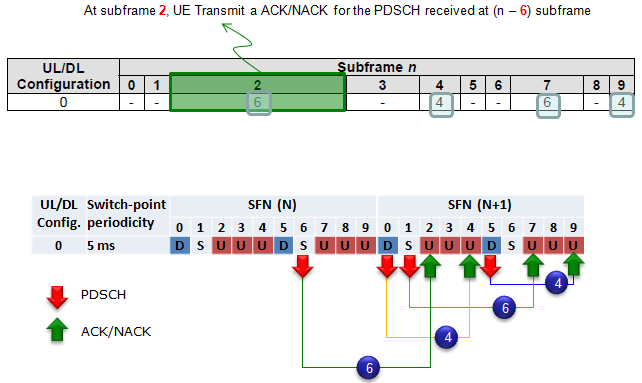 For example, if UE gets too many DL subframe before the UL subframe, it will be difficult to transmit the all the reply in the UL transmission because PUCCH space is not big enough to accomodate all the HARQ ACK/NACK. So they came out with very complicated/confusing table as shown below to define HARQ response to cope with this kind of situation. 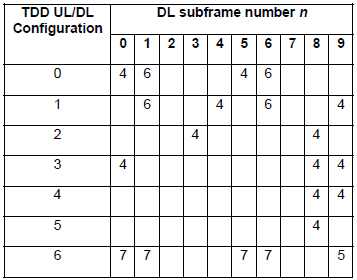 In this section, I will explain how to interpret this table and figure out the exact HARQ response timing for each UL/DL configuration. 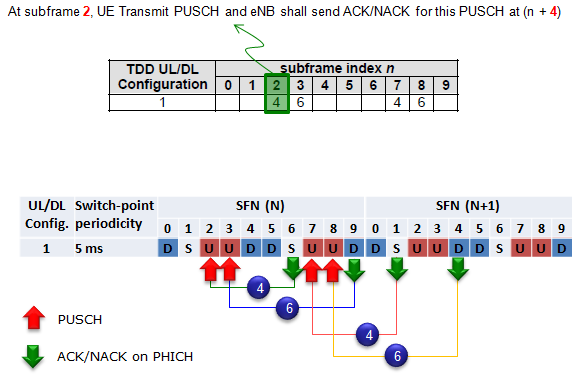 Following table shows the Ack/Nack Transmission Timing from UE for the PDSCH it recieved. Problem is how to interpret this table. Following shows how to interpret each raw of the table. In case of UL/DL Configuration 0, Ack/Nack response timing for the PDSCH that is received by UE is transmitted according to the following rule. How do you interpret this table and DL/UL correlation ? In case of UL/DL Configuration 1, Ack/Nack response timing for the PDSCH that is received by UE is transmitted according to the following rule. 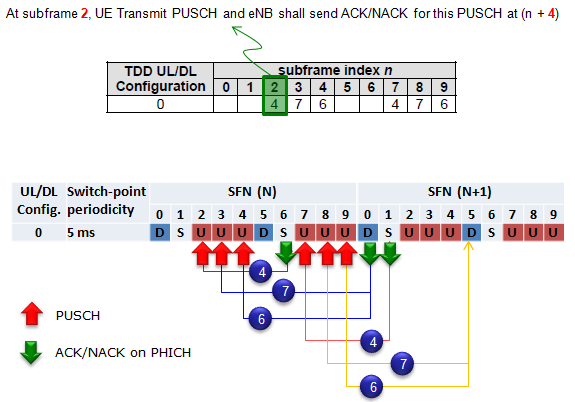 In case of UL/DL Configuration 2, Ack/Nack response timing for the PDSCH that is received by UE is transmitted according to the following rule. Please try to do the same analysis for the remaining UL/DL Configuration on your own. It would be the best way for you to understand the meaning of the table clearly. The Time delay between SR(Scheduling Request) and DCI 0 is not clearly specified in 3GPP specification. So basically, NW can send DCI 0 in any available DL subframe after reception of SR, but depending on the eNodeB and Test Equipment some minimum time interval may be required. If UE recieves DCI 0 at subframe n, it should send PUSCH at subframe n + k where k is defined as follow. I will post some graphical explanation for this table later. Until then, give it a try on your own to understand this table. What was your first impression about all the Ack-Nack report mechanism described above ? My first impression was "So complicated !" and "So.. So.. So.. confusing". Unfortunately.. there is more serious problem than the 'confusing things'. It is about troubleshooting issues. Let's assume that you are using DL/UL Configuration 2. and suppose UE sent a NACK at Subframe 2. How did you know whether the NACK is for PDSCH at subframe 4 or 5 or 6 or 8 ? (As you know, in FDD.. the answer is so simple since the ACK/NACK from the UE is always for the PDSCH that it received 4 subframe before. If it is FDD, the answer is supposed to be 'it is for PDSCH received at subframe 8 in previous SFN), but in TDD case it is different as you may guess. Then how do you correlate the NACK to the specific PDSCH which caused the NACK. It is completely dependent on how much detailed information that your UE log or Network log provide. If UE log or Network log provide ACK/NACK information and HARQ process number for every subframe.. you can try following procedure. i) First, check UCI info at specific SFN and subframe number (let's label this as 'SFN_n:Subframe_2') and locate the HARQ process number that caused NACK. ii) Go to transmitted PDSCH list 'around' SFN_n:Subframe_2 (at this point, you would not know exactly which subframe you have to pin point out). iii) Look through several subframes upwards and downwards to find the subframe that is marking the same HARQ process number as you got at step i). That is the subframe that caused NACK. 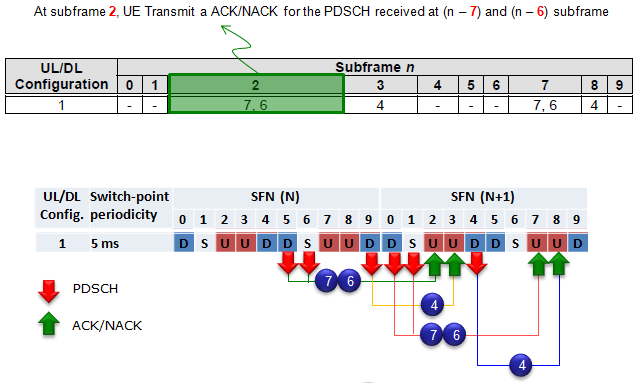 As described above, in TDD LTE ibe subframe can transmit ACK/NACK for multiple subframe as shown below. 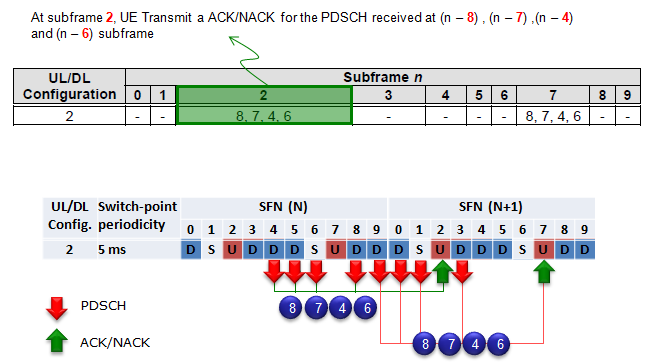 In the following figure as an example, UE send ACK/NACK for 4 PDSCHs in subframe 2. What should eNB do if the subframe 2 send NACK ? Does it have to retransmit the whole 4 PDSCHs ? or transmit only PDSCH which is NACKed ? The answer to the question gets different depending on tdd-AckNackFeedbackMode setting in RRC message (e.g, RRC Connection Setup or RRC Connection Reconfiguration). If it is set to be 'bundling', eNB should retransmit all the PDSCH. If it is sent to be 'multiplexing', eNB should retransmit the only PDSCH which is NACKed. For TDD UL/DL configuration 5 and a UE that does not support aggregating more than one serving cell, only HARQ-ACK bundling is supported. 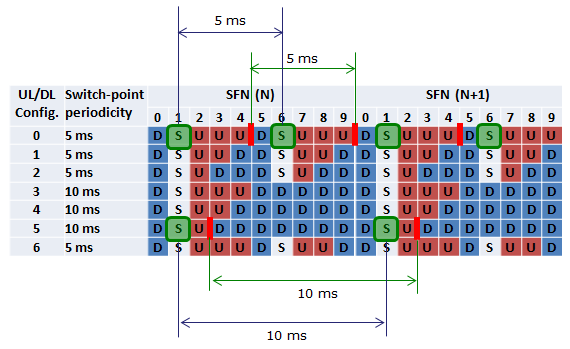 If a UE that supports Carrier Aggregation is configured by higher layers to use HARQ-ACK bundling, PUCCH format 1b with channel selection according to the set of Tables 10.1.3-2/3/4 or according to the set of Tables 10.1.3-5/6/7, or PUCCH format 3 for transmission of HARQ-ACK shall be used. 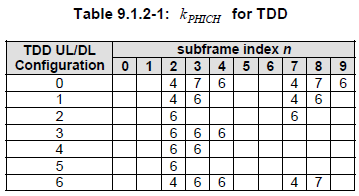 PUCCH format 1b with channel selection according to the set of Tables 10.1.3-2/3/4 or according to the set of Tables 10.1.3-5/6/7 is not supported for TDD UL/DL configuration 5. For TDD HARQ-ACK multiplexing and a subframe n with M = 1, spatial HARQ-ACK bundling across multiple codewords within a DL subframe is not performed, 1 or 2 HARQ-ACK bits are transmitted using PUCCH format 1a or PUCCH format 1b, respectively for one configured serving cell. You would notice the variable 'M' in many of the statement above. M is defined to be "the number of elements in the set K defined in Table 10.1.3.1-1". Following examples would give you clearer idea on the meaning of M.